The iguana slipped through the bars of the prison just in time. The door opened and in stepped the rhino chief with a sneer. He chuckled, not noticing the flat new member of the prison. Then he threw in a few apple cores, a moldy piece of cheese, and a few crumbs of bread. The mice squeaked excitedly. The rest looked on in disgust. He left without noticing the keys were gone. The iguana slid back out, unlocked the prison gates, and threw them wide open. “Oh, hoorary!” cried all the animals. They forgot to keep their voices down. The door to the dungeon room flew open and there stood the rhino chief, gaping at them. “Let’s go!” shouted the bear. They all pushed out of the door, bouncing the rhino chief up the stairs and sending him sailing into a wall. More rhinos rushed to investigate the commotion and paled when they saw the Rainbow Animals charging straight at them. “Phew! Escaping could be a lot worse,” panted the armadillo after they had bowled their eighth rhino out of their way. Suddenly three guards stepped into their path, leveling their spears at them. “Brake!” yelped a dog, but they couldn’t stop in time. They slid right under the guards’ legs and sent them flying. The animals turned right, then left, then right again, and stampeded out the castle. They were just in time. From behind them came a thunderous clap. 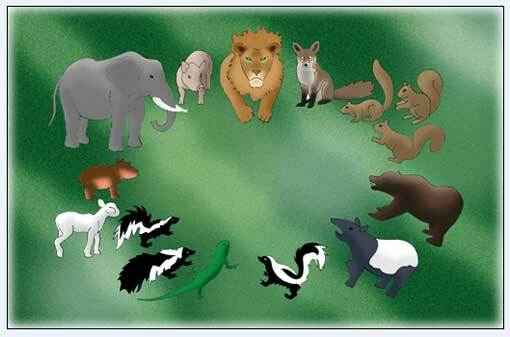 The animals spun around, jaws dropping in amazement. The fortress was crumbling before their eyes. Towers fell upon each other, and the earth trembled. What the animals didn’t know is that when they sent the rhinos flying like bowling pins, the rhinos knocked their heads on the ceiling of their castle. Then the castle began crumbling because the rhinos knocked their heads so hard that pieces of the ceiling fell out. Also the castle was very badly designed. “The rhinos are going to have a huge headache after that,” commented the fox, not knowing the rhinos were already seeing stars. “I didn’t really care about the rhinos, but I did like that castle,” sighed the tapir. “Well, I didn’t like that drawbridge,” sniffed the iguana. “You don’t like anything,” laughed the bear. When the animals returned to their forest, the lion got an air pump and pumped the iguana right up. Now he was the biggest iguana in the world, and so he became King Iguana, king of all the animals. And the Rainbow Animals lived happily ever after.